It has been claimed that the geological column as a faunal succession is not just a hypothetical concept, but a reality, because all Phanerozoic systems exist superposed at a number of locations on the earth. Close examination reveals, however, that even at locations where all ten systems are superposed, the column, as represented by sedimentary-thickness, is mostly missing. In fact, the thickest local accumulation of rock is only a tiny fraction of the inferred 600-million year’s worth of depositions. The global ‘stack’ of index fossils exists nowhere on earth, and most index fossils do not usually overlie each other at the same locality. So, even in those places where all Phanerozoic systems have been assigned, the column is still hypothetical. Locally, many of the systems have not been assigned by the index fossils contained in the strata but by indirect methods that take the column for granted—clearly circular reasoning. Thus the geologic column does not exist and so does not need to be explained by Flood geology. Only each local succession requires an explanation and Flood geology is wholly adequate for this task. Does the geologic column exist? If so, to what extent? With geological periods and epochs extending for hundreds of millions of years the column clearly contradicts the biblical time scale. Thus for many people, the geological column is an obstacle to their accepting a recent Creation and a world-wide Flood as recorded in Scripture. Creationists have shown that the geological column presents no problem to Flood geology. It is nothing more than a hypothetical classification scheme based on selected rock outcrops in Europe, and used flexibly to classify rocks around the world.1,2 Anti-creationists have responded that the column is valid, having been built up in a thoroughly logical way long before the theory of evolution was invented, and that many of those who contributed to its building were creationists.3 One unanswerable argument for the hypothetical character of the column is that nowhere in the world does the complete column exist. The majority of the geological periods are missing in the field. Although anti-creationists usually have not disputed that the column is mostly missing, they have argued that we should not expect the entire column to exist in the field. Erosion, they argue, is why the complete column is never found.3 Hence they claim that rocks deposited during one period would be eroded away during a later period. So, while those defending the column have invented ad hoc reasons to explain the missing geologic periods, they did not deny the hypothetical nature of the column. Recently however, there have been a number of recurrent claims that the geological column is more than a hypothetical concept and that it actually exists.4 Some of these claims have been made on the Internet and, as an active creationist scientist, I don’t have the time to fan the windmills of debate on this totally unregulated, unrefereed medium. Anyone can say anything on it, no matter how untrue. However, the claims made on this medium should not be ignored completely. We must provide responses from time to time so the critics and their readers don’t think their claims are unanswerable. It is on the Internet that a number of geographical localities have been nominated where it has been asserted that the entire column is actually superposed period upon period in the one place.5 This is one of the few intellectual-sounding arguments on the anti-creationist sites that some people may mistakenly take seriously. Thus I address the bogus arguments of some of these articles relating to the geologic column. I want to examine these claims closely, first correcting common misrepresentations of creationist literature on this subject, then delving into the geologic issues involved. How is the Geologic Column Defined? Morton’s claim is very misleading. The unsuspecting visitor to Morton’s website gets only a small part of the story. Yes, Morris and Parker,1 whom Morton attacks, are not strictly accurate when they say there is no place on earth where all ten geologic systems are superposed. (I combine the Mississippian and the Pennsylvanian into the Carboniferous system, and omit the surficial Quarternary deposits.) However, it is wrong to state or imply that most creationist scholars believe this to be true. Back in 1968, Harold Clark6 made it clear that there are many places on the earth with most or all of the ‘complete’ column in place. In 1981, I re-examined this fact, and quantified it.2 More on this later. ‘The column is supposed to represent a vertical cross-section through the earth’s crust, with the most recently deposited (therefore youngest) rocks at the surface and the oldest, earliest rocks deposited on the crystalline “basement” rocks at the bottom. If one wishes to check out this standard column (or standard geologic age system), where can he go to see it for himself? There is only one place in all the world to see the standard geologic column. Figure 1. The presence or absence of all ten Phanerozoic systems in a ‘stack’ is not the only issue concerning the reality or otherwise of the geologic column. The column to the left represents the maximum thickness of sedimentary rock attributed to each geologic period (100 miles). 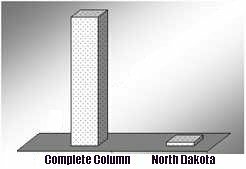 The column to the right represents to the same scale the thickness of sedimentary rock in North Dakota. Clearly the geologic column is far from complete in North Dakota. Note that Morris and Parker are not saying that the presence or absence of all ten Phanerozoic systems in a ‘stack’ is the only issue defining the reality or otherwise of the geologic column. What they are saying, as is seen in the part usually not quoted by anti-creationists, is that nowhere on earth is the geologic column complete in the sense of having the maximum thickness of sedimentary rock attributed to each geologic period. It is time anti-creationists stop misrepresenting Morris and Parker. Morton’s comments have no semblance to reality. Creationists do not say that every single day’s deposits must be preserved! The fact is that Morris and Parker are not talking about a little of the daily sediment being missing. If we read the Morris and Parker quote again, we can see that the 100- or 200-mile column is not the presumed product of daily sedimentation. Rather, the 100- to 200-mile column represents the sum of the thickest sections from the field of each of the ten Phanerozoic systems and/or their major components. Now what does all this mean? Common sense teaches us that 16 miles (at most) which exists, out of a total of 100 or 200 miles, is a very incomplete column! It remains primarily an invention of the uniformitarian imagination, and a textbook orthodoxy. So, although there are places where lithologies referable to all ten of the Phanerozoic systems can actually be seen superposed, creationists remain more than justified in highlighting the essential non-existence of the standard geologic column. And we have not even touched such matters as overlapping fossil ranges, non-superposed index fossils, and many other things, which expose the non-reality of the geologic column. That is, most fossils found are for only one geologic system (e.g. Devonian), and most index fossils do not actually superpose at the same locality. In other words, most locations with Devonian fishes are not overlain by rocks bearing Cretaceous ammonites, and most locations with Cretaceous ammonites do not overlie localities with Devonian fishes. The same can be said for all the index fossils of all of the geologic systems. Can the Geologic Column be Found? So, why did I do the work? As I said on the first page of the article, the aim was to measure the degree of incompleteness of the geologic column. That is why I set up the maps, tables, and graphs to show the percentages of the earth’s surface that have various combinations of the ten Phanerozoic systems in place. I thus had considered the sedimentary Phanerozoic systems not only as single, unrelated entities, but also in terms of stratigraphically consecutive combinations. There are other ways in which Glenn Morton’s criticism of my work is without foundation. Morton11 has led his readers to believe that I had only mentioned Poland and Bolivia, and that, furthermore, I was claiming that those are the only locations on earth with the ten geologic systems in place. Actually, I specifically mentioned other potential places with the ‘complete’ column (e. g., Cuba, Indonesia, and the Himalayas).12 Morton is saying nothing new at his website when he cites additional locations where the ‘complete’ column is found and shows them on a visually-attractive world map. Note that most if not all of the locations that Morton mentions can be found on Map 15 of my article.13 These locations appear as white spots on Map 15, and include such places as northwest Russia, Siberia, the Caspian-Sea region, parts of China, the Williston Basin in the western USA, Bulgaria, Chile, Tunisia, central Mexico, and Iran/Iraq/Afghanistan. It is of course, possible that some smaller locations with ten superposed geologic systems have been lost in the level of resolution afforded by the Alexander Ronov et al. maps used in my study. But where does Morton get his information? He cites as his source the work of the Robertson Group, a London-based oil-consulting company. I have been unable to secure a copy of this work, as it is not listed in either WorldCat or GEOREF. Thus I cannot comment on the accuracy of this source of information, nor discern whether or not its portrayal of sedimentary basins is overly schematic. Evidently, Morton is citing a proprietary source not subject to public scrutiny. But let us, for the sake of argument, grant the complete validity of what the Robertson Group states, as represented by Morton. Even then the claims are overly generalised. For example, Morton’s does not say how given strata had been ‘dated’. Which ‘geologic ages’ had been identified according to the faunal content of the strata, and which had simply been ‘guesstimated’ according to lithological similarity and/or comparable stratigraphic position with faunally-dated sedimentary formations at adjacent locations? All this is moot, however. As noted earlier, since most of the sediment is missing, Morton’s arguments are completely specious even if the Robertson Group work is thoroughly accurate and not excessively schematic in its depiction of the world’s sedimentary basins. If this were not enough, the situation gets worse when we include the faunal basis for separating and correlating the lithologies into ‘geologic periods’. As mentioned earlier, only a small fraction of index fossils are superposed at the same location on Earth. This has been documented in my Diluviological Treatise.15 Therefore, all things considered, scientific creationists are more than justified in concluding that the standard evolutionary-uniformitarian geologic column is, in fact, essentially non-existent. To rescue the situation, anti-creationists have argued that the 1% of the earth’s surface where the lithologies of all ten geologic periods can be found simultaneously is somehow more significant than the remaining 99% where they are not superposed. Consider the contortions of facts and logic this entails. Morton makes an enormous leap when he claims the 1% means the geologic column exists.16 Of course, as noted earlier, this misrepresents Morris and Parker, myself, and other creationists. And, again, it completely ignores the fact that only 16/100 to 16/200 of the column are actually present in any one spot—not to mention the palaeontological factors which, as discussed above, make the geologic column even more artificial than appears at first. Glenn Morton also made the extravagant claim that the finding of ten superposed Phanerozoic systems is ‘an important prediction’. Actually, as everyone who has studied the development of the geologic column knows, the geologic systems were constructed on an ad hoc, deductive basis. Nowhere in the 19th century geologic literature, at least to my knowledge, is there a hint of a claim that an eventual find of ten superposed systems is a necessary phenomenon for validating the (presumed) reality of the geologic-age system. If such a citation from the early geologic writings exists, I would gladly be corrected. Until and unless such a citation can be produced however, I think that we best treat this claim with the proverbial grain of salt. Let us consider this claim in a different way. Assume for a moment that it had been established that there was no geographic location on earth where ten geologic systems were found superposed in a quasi-complete column. Would the failure of this supposed ‘prediction’ have caused uniformitarians to reject the validity of their geologic column? Not likely! The claim that finding ten superposed geologic systems is ‘an important prediction’ is clearly false. Some anti-creationists have calculated the extreme improbability of ten such systems ever being deposited by chance during the Flood. Such a calculation is patently absurd, because creationist scientists do not believe that the order of fossils in the stratigraphic record (and hence the ten-named geologic periods) is entirely (or even primarily) the result of chance processes during the Universal Deluge. And, of course, any mixing of organisms during the Flood has already been accounted for by evolutionists by such things as long-ranging fossils (which are thereby not used as index fossils), and ‘reworking’ rationalizations, etc. Some readers of both my Essential Nonexistence and Diluviological Treatise articles10 have questioned the relevance of overlays to measure the lithological succession of Phanerozoic systems (in the former), as well as the succession of types of fossils (in the latter). Their objections revolve around the fact that strata are three-dimensional and interlayered with other strata. To begin with, I had taken the three-dimensionality of the strata into account by tacitly accepting, as a given, the superposition of lithologies ascribed to different geologic periods. That is, when I considered a map of Ordovician strata and one with Cambrian strata, I assumed that, where the two systems occur in the same geographic locality, Ordovician strata always overlie Cambrian strata (and never the reverse). As for the lateral continuity of strata, it had been argued that, since strata overlie each other not only directly, but also through a series of overlaps (much as the tiles of a gabled roof), therefore strata should be counted as stratigraphically superposed. This would be analogous to the uppermost tile on a gabled roof being reckoned successionally higher not merely over the immediately-underlying tile, but also over all of the successively-shingled tiles going down to the base of the roof. However, strata change in character laterally, and so cannot be treated as tiles on a roof. This is why long-distance correlations of strata should not empirically count as superposition.17 I later addressed this perennial objection in more detail in my Clarifications Related to the ‘Reality’ of the Geologic Column article,18 focusing on such things as so-called time-transgressive lithologies, so-called facies changes, etc. That is, presumed horizons of geologic time cut across lithologies, and, reciprocally, different adjacent lithologies can be ascribed to the same geologic age. Thus, for instance, the same sandstone can be partly Cambrian and partly Ordovician. Conversely, a Cambrian sandstone can grade laterally and/or vertically into a Cambrian shale. Since lithologies are not consistent with presumed units of geologic time, their shingling relationships cannot count as an evidence for time-based stratigraphic successions. Figure 2. It has been argued that strata should be counted as stratigraphically superposed because strata can overlie each other through a series of overlaps like the tiles of a gabled roof. However, strata change in character laterally over long distances and the horizons of supposed geologic time cut across lithologies. So regional overlapping cannot be empirically counted as superposition. It was for these, and similar, reasons, that I had concluded that the interlayering of strata, and lateral continuity of the same, do not constitute independent evidences for the validity of the geologic column. This fact also implies that the series of overlays, as performed for the previous study, is in fact a valid approach for assessing the degree of the non-existence of the geologic column. So does the superposition of fossils instead of the superposition of time-designated strata. ‘Missing’ geologic periods are routinely blamed on non-deposition and/or erosion, and I have already exposed the circular reasoning used behind such premises.19 However, since these arguments come up over and over again, I will deal with them once more. Periodically, we also hear the claim that ‘missing’ geologic periods are expected because the earth was never ‘depositional’ everywhere at the same time. After all, it is said, even today the entire earth’s surface is not undergoing deposition of sediment.20 Such arguments, while superficially logical, can only beg the question about the earth’s age and the ability or otherwise of sedimentary environments to prograde all over the earth within a given long-time period. Without first assuming the validity of the geologic column, and using it as a tool to find times as well as areas of non-deposition, there is no way of independently knowing anything about ostensible long-term areal trends in sedimentary deposition. That is, without the complete geologic column as a reference, who can possibly know how much of the Earth’s surface has been depositional simultaneously in any period of several tens of millions of years (i. e. the average duration of a geologic period)? In most locations on earth, there is no independent evidence for non-deposition and/or erosion of presumably once-existing strata. Usually, erosional removal is simply assumed for a given geographic region because rocks assigned to one geologic period (or more) are regionally absent. The paraconformity where no discordance of bedding is noticeable. Paraconformities are proposed between strata for the sole reason that appropriate index fossils are absent from the intervening geologic system. 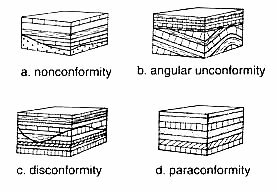 Paraconformities usually show no evidence of subaerial exposure or the supposed millions of years between strata. It is also important to realise that the maps in the Essential Nonexistence article22 already account, to a considerable extent, for those locations on earth where there is independent geologic evidence of the erosional removal of rock. After all, these maps are not only lithologic maps but also paleogeographic ones. The thinnest category of sedimentary lithologies (0–100 m) on the originally-redrawn Ronov et al. maps thus includes the onetime coverage, by sedimentary rocks, of geographic regions for which only outliers exist as evidence of the former coverage. For example, the Ronov et al. maps show the City of Chicago covered by Devonian and Carboniferous rock. This is in spite of the fact that there are no Devonian and Carboniferous strata underlying Chicago at present, with the exception of a few inliers, such as the Devonian and Carboniferous ones in the Des Plaines Disturbance. These in fact demonstrate that the two systems had in fact once covered all of Chicago but had subsequently been eroded away. Thus, the maps, which I have used in the previous study, already account for the empirical evidences of rocks of a given ‘age’ once having been present in geographic regions beyond their present regular occurrence. Beyond this, with the exception of angular unconformities, there is little or no solid independent evidence for an erosional removal of once-deposited sedimentary systems. Thus, following the statements by Watson above, most of the ‘missing’ ages, which are the rule for the earth, are in fact based upon circular reasoning. There are a number of locations on the earth where all ten periods of the Phanerozoic geologic column have been assigned. However, this does not mean that the geological column is real. Firstly, the presence or absence of all ten periods is not the issue, because the thickness of the sediment pile, even in those locations, is only a small fraction (8–16% or less) of the total thickness of the hypothetical geologic column. Without question, most of the column is missing in the field. Secondly, those locations where it has been possible to assign all ten periods represent less than 0.4% of the earth’s surface, or 1% if the ocean basins are excluded. Obviously it is the exception, rather than the rule, to be able to assign all of the ten Phanerozoic periods to the sedimentary pile in any one location on the earth. It does not engender confidence in the reality of the geological column when it is absent 99% of the time. Thirdly, even where the ten periods have been assigned, the way in which they were assigned can be quite subjective. It is a well known fact, for example, that many unfossiliferous Permian rocks are ‘dated’ as such solely because they happen to be sandwiched between faunally-dated Carboniferous and faunally-dated Triassic rocks. Without closer examination, it is impossible to determine how many of the ‘ten Phanerozoic systems superposed’ have been assigned on the basis of index fossils (by which each of the Phanerozoic systems have been defined) and how many have been assigned by indirect methods such as lithological similarity, comparable stratigraphic level, and schematic depictions. Clearly, if the periods in these locations were assigned by assuming that the geological column was real, then it is circular reasoning to use the assigned ten periods to argue the reality of the column. Finally, the geological column is a hypothetical concept that can always be rescued by special pleading. A number of standard explanations are used to account for missing geological periods, including erosion and non-deposition. Clear field evidence, such as unconformities, is not necessarily needed before these explanations are invoked. Similarly a range of standard explanations is used to account for the fossils when their order is beyond what the column would predict. These include reworking, stratigraphic leaking, and long-range fossils. Even if all ten periods of the column had never been assigned to one local stratigraphic section anywhere on the earth, the concept of the geological column would still be accepted as fact by conventional uniformitarian geologists. To the diluviologist this means, of course, that only the local succession has to be explained by Flood-related processes. Very seldom do all ten geologic systems have to be accounted for in terms of Flood deposition. There is no escaping the fact that the Phanerozoic geologic column remains essentially non-existent. It should be obvious, to all but the most biased observers, that it is the anti-creationists who misrepresent the geologic facts. The geologic column does not exist to any substantive extent, and scientific creationists are correct to point this out.